Cerebus the Aardvark is a character by Dave Sim. Cerebus’ own comic spans 300 issues, from 1977-2004. 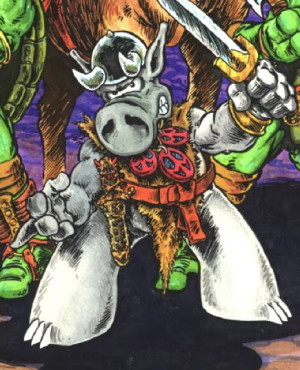 He made an appearance in Teenage Mutant Ninja Turtles issue 8 (Mirage). The Turtles teamed up with Cerebus to get the Time Scepter back from Savanti Romero.